Arm-of-the-Sea is lending its artistry to a number of community events this season and we’re looking for volunteers to help perform with us. Dates and locations currently on the roster are listed below. Some events will require rehearsals. Contact art@armofthesea.org for further details. Please share this with friends; and then join us for these special occasions. Four puppeteers needed for walk-around characters at proposed riverfront park. Times approx:9am-5pm. Six puppeteers needed for procession in uptown Kingston followed by a short performance at BSP. Approx:2:30-7:30pm. A dozen puppeteers needed for this strolling street scene with thousands of onlookers. Approx:10am-1pm. 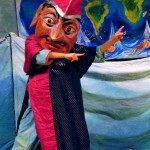 Fri. July 22 – Free Columbia Puppet Theater, Hudson NY. Aug.19-21 – THE 2016 ESOPUS CREEK PUPPET SUITE at Tina Chorvas Waterfront Park, Saugerties, NY. Performers young and old, stage hands and site crew needed for this annual site-specific outdoor spectacle. Rehearsals:6-10pm on Aug.14-18. Performances:8-9:30pm on Aug.19-21.